RIM just became BlackBerry altogether and the brand new BlackBerry 10 mobile operating system ushered it in a completely new era that will determine the future of the company. Given the timeframe for the launch and the pressure the Canadians were working under, they did a great job at making something different not for the sake of it, but an actually stand-out and useful experience - from the virtual keyboard through the camera options to the real time info gathering and the true multitasking, aided by 2 GB of RAM on the new BlackBerry Z10 handset. The most amazing achievement, however, is the fact that BB10 will launch with more than 70,000 apps behind it, which is most than there have been for any mobile OS at launch, and shows that BlackBerry didn't want to rush anything half-baked just to have it out there, and leave clients twiddling their thumbs until waiting for major apps to arrive. BlackBerry outed a series of walkthrough videos for all the main differentiating features of its new platform, built on the rock solid QNX Neutrino kernel, so you can familiarize yourself from the source with the innovative BB10 below. real multitasking.....no other mobile os could beat that !! lol... its not real, it freeze them or stop them! While that is the case with many android apps, android is capable of "true" multitasking. Not only can two apps be running at once, they can co-exist on the same screen. if you had used playbook , you might have understood man . it multitasks really great n it could beat any android tablet with same spec as playbook. qnx is used by many us defence networks because the advanced memory management can improve their performance up to 30% while android is not optimised well enough. Saying that QNX multitasks better than android is not the same as saying that Android does not really multitask. The former is an opinion that is backed by fact and the latter is completely false. actually, meego did that, nokia just ditched it! This all on the back end of a solid PA 5/10 rating from Blackberry's latest entry. BB is way behind, i'm not entirely sure how they're going to pull this off. Screen Sharing is the only impressive feature. 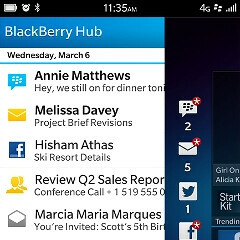 As I said before, BB10 will not be succesfull. To say the most apps at launch is as if BB is a brand new phone OS, but I suppose if we cherry pick and start over again with BB at BB10, then ok....not that it really matters...if people buy a phone because of its appstore and not because of the hardware, then something is wrong. Ok....I am REALLY excited about this. I gotta say....I never was for the iPhone...never was for WP....This and Android are the only 2 mobile platforms I have ever been excited about. By the time I got into smartphones....WebOS was on its way out...so I never got a chance to pay attention to it. I didnt like any of the hardware of an Web OS phone. That was their biggest downfall IMO. I was hoping more out of a platform that is brand new and has seen all the features of other competing OS in the market. Even though they have all the features that other platforms have.. they have nothing new.. profile changer is available on Android since froyo.. but seems like blackberry has targeted the corporate brigade again more than the common user. They have new features that will benefit the corporate.. but nothing new and exciting for people like us.. still waiting for a full review though.. coz all these are videos by blackberry and i would like to see how they perform in realtime and not on ads. Nice. But Android developers will come with a similar-working launcher, a similar-working camera app, a BB10 theme, a similar-working custom keyboard and widgets in weeks. Android >>> anything else, because everything which is done in another platform UI-wise, can be done on Android. and isn't this considered the purest form of flattery which is copying? I'm anxious to see how BlackBerry does. Yeah, pretty much everything you can do on one phone you can find a way to do on other phones. To me, it's all about the packaging of the OS. How user-friendly is it? How efficient is it to get information to you? Yeah, most, if not everything, RIM is introducing exists, but to go from that far behind to catching up with everyone else is only a FIRST step in coming back. This puts them in position now to start innovating, if they catch back on. The more competitors you have, while it does fragment everything, you also have more think-tanks trying to out-do each other, rather than just two major players one-upping each other just enough. I think there's room for Android, Apple, Microsoft, and RIM. Plus, things are settling into a routine of 1-2 flagship phones, then the outdated flagship phones become the mid-range phones, so there's a little less saturation with phones. And, buying a phone now doesn't out-date it as quick with this model. With their previous focus on corporate users, and their already existing install base (what's left of it, anyway), you need to start small to make strides. They didn't fall quickly, and they won't rise back up quickly. If they stay focused on corporate users for the time being, they'll be taking their previous approach to selling their phones. Start with companies, and work their way to consumers.